What Solve360 Triggers and Actions are Supported? New Workgroup - Triggers when you add a new workgroup. New Tagged Contact (Beta) - Triggers when a specific tag is applied to a contact. New Tagged Contact - Triggers when a specific tag is applied to a contact. New User - Triggers when you add a new user account. Create Contact - Create a new contact. The first thing you'll need to do to get started with hooking up Solve360 with Zapier and hundreds of other services is to add your Solve360 Account to Zapier. Click to add a Solve360 account in your Zap. Next you will give your new Account a name or label, which is just a handy name for you to recognize within Zapier. It doesn't matter what you name it. 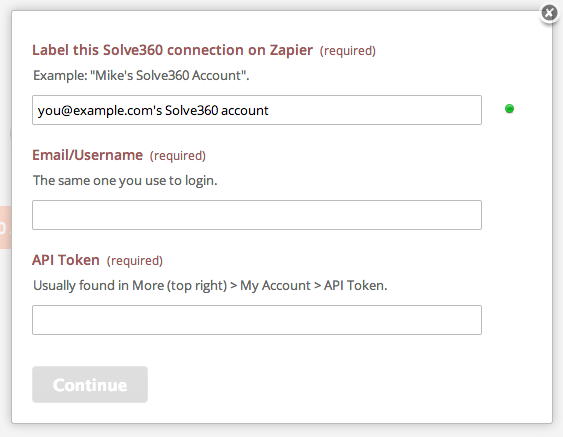 You should then get a pop-up window from Solve360 asking you to log-in to authorize the connection between that Solve360 account and Zapier. If you are already logged in the pop up will show right away. Next you will retrieve your API key from Solve360. The API token is usually found in More (top right) > My Account > API Token. After retrieving your API token, enter it into the "API Token" field under your Account title field. Confirming your Solve360 API key finishes the process! Your Solve360 account is now connected to Zapier.